The Diamond Shopping Centre adds to the wealth of top high street names and boasts a top floor food court with fabulous views of the river. Offering select independent boutiques with unique designer brands along with the well known national retailers it is well worth a visit! 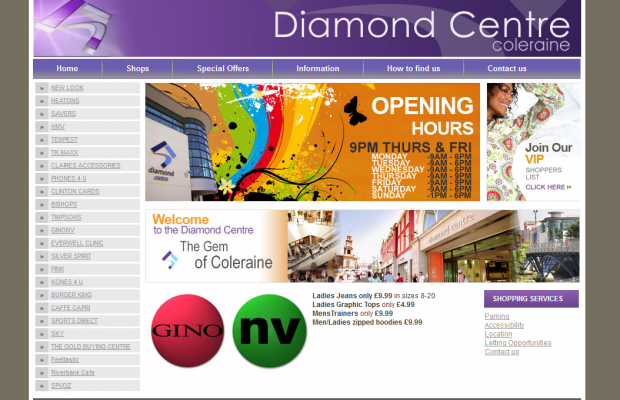 I need to thank you most sincerely for the fantastic vibrant website that you have designed for the Diamond Shopping Centre. It is very impressive and is so user friendly. I have received many congrats from my management agent, my landlord and the tenants on the launch of this website. It has been praised for its design, content and when I told them how much it cost me they could not believe how competitive it was. I agreed with them that it was definitely great value for money.